Product #45443 | SKU TRI8CV | 0.0 (no ratings yet) Thanks for your rating! The Amaran Tri-8 packs unprecedented power in an incredibly tiny amount of space. It packs 888 high-CRI (95+) LED lights into a 30cm panel. The high LED count means the Tri-8 is capable of outputting 24000 lux @ 0.5m, which is equivalent to a 600w tungsten light. The Tri-8c has a colour temperature that's variable from a warm 2300K to a cool 6800K or anywhere in between to match other fixtures, ambient light situations, or just for creative effects. Light intensity is also variable and can be adjusted along with the colour temperature on the fixture or at distances up to 150 m with the included 3-channel wireless remote control. The light has a 45-degree beam angle for medium-wide coverage, an output equivalent to a 600W tungsten source, and a high CRI/TLCI rating of 95+, indicating accurate colour rendering. Like all LED lights, this one runs barely warm to the touch thanks to a quiet fanless thermal management, making for a cooler studio and comfortable talent. The Tri-8c can be stand-mounted via its 1/4"-20 tap or handheld vertically or horizontally by using the stainless steel U-handles at the back of the fixture. The Tri-8c has a New Zealand and Australian compatible power supply that is also suitable for worldwide use with the inclusion of a 100-240 VAC adapter. It can also run on V-Mount-type batteries when mains power is unavailable. An EZ Box softbox is provided to soften the Tri-8c's output while adding a flattering quality of light with manageable contrast. A carry bag is also included. Impressive power in a small package. 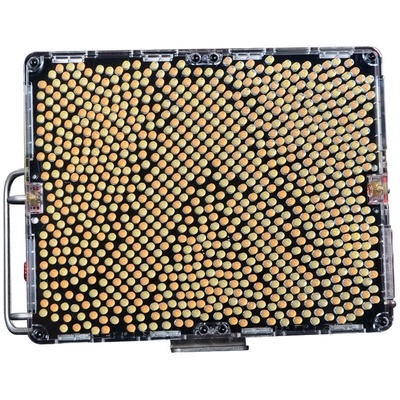 It packs 888 high-CRI (95+) LEDs into a 26.1 x 19.9 cm panel. The high LED count means the Tri-8 is capable of outputting 23,000 lux @ 0.49 m, which is equivalent to a 600W tungsten fixture. AC or Battery Powered. You can run the Tri-8 on mains current with the included adapter or on battery power thanks to the inclusion of two F970 batteries. The Amaran Tri-8 has a fanless thermal management system. With gold lamp beads on the inside, a custom aluminium plate, and the external increase of the flow-type cooling fins, cooling is maximised across the unit. The rugged Amaran Tri-8 has an aircraft-grade aluminium body and slim design, allowing for efficient heat airflow while maintaining a durable structure. To further enforce its durability, the LED bulbs are covered by an impact-proof polycarbonate casing. The stainless steel handles in the back of the light allow you to position the light either vertically or horizontally. The light can be used on a stand, or handheld for fast-paced on-the-go shoots. The Amaran Tri-8 comes with an EZ Box to maximise your light-shaping capabilities. The EZ Box softbox prevents spill light, reduces contrast, and provides high quality diffusion. Since the Tri-8 is virtually the same size as the 528/672, the EZ Box and grid are also compatible with this new light fixture. This also includes a growing list of third party softbox offerings that can work with the Amaran Tri-8. The Amaran Tri-8 comes with the same 2.4 GHz remote used on most of Aputure's lights. The VA remote has three channels, four groups, and works up to 150 m away. Using the remote, you are able to control the brightness and colour temperature of the Tri-8.